Have you ever had a programming book that you had to keep near you? This list of must-have books are required reading and should always be within your reach. When you grow in your career, you start to notice that tutorial books don't line your bookshelf anymore. Nor do you own "how to code in ASP.NET in 5 minutes." Coding becomes easier. As I've said before, a language is a language is a language. 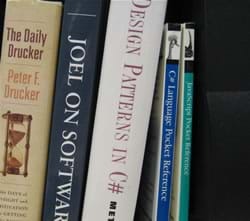 These programming books are a testament to the author's experience. It just goes to show you that these books I list below are exceptional in every way and have stood the test of time in the lines of development and design. Now I know what some people are saying. You have the Internet at your fingertips, why not use that? While the Internet is a great resource, there is something to be said for a solid book that I KNOW has the answers (and sometimes more) within arms reach. I'm not saying all material on the Internet is bad, but it does take time to research that topic. When I've gone through these programming books and trust the material, I would feel more comfortable reaching for one of these following books/authors. My preference of book publishers are Wesley-Addison Signature Series, APress, and O'Reilly. In That Order. It's true this book is a little pricey, but Mr. Fowler has put his experience and knowledge into enterprise application development and this book is an exceptional mark of his programming experience. On the inside cover of the book, they provide you with a list of programming thoughts and then provide you with a pattern to apply to that thought. It's kind of like trying to remember the name of that song and all you have is a lyric. A quarter of the book gives an intro on layering, organizing domain logic, sessions, concurrency, and mapping to databases. During each of these sections they discuss a topic and use a number to refer to the pattern used in the book. These pattern numbers are in the remaining 3/4 of the book and I've used this strictly as reference when needed. The functionality of ReSharper is based on this book. For those not knowing about ReSharper, it's a Visual Studio extension that gives developers a significant boost in productivity by assisting with refactoring their code with confidence (Those who want to know more, I wrote a couple posts about ReSharper here, here, and here). Just like Patterns of Enterprise Application Architecture, this book goes over the basics of taking your code from spaghetti to lasagna (wait...is that better?). The first part of the book discusses "bad code smells", how to identify bad code, and ways to fix it. Such refactorings include Long Methods, Large Class, Long Parameter List, Duplicated Code, and Switch statements to name a few. The code examples in this programming book are either Java or .NET or both and are extremely clear to understand each refactoring concept. After you read the two books above, make sure you add this one to the list as well. If you thought both previous programming books were extremely valuable, then I highly recommend this book because it combines enterprise patterns with refactoring. For example, let's say you have a huge if..then..else from hell. One refactoring called Replace Conditional Logic with Strategy Pattern takes the if..then..else and makes classes out of them while creating an abstract pattern to handle the heavy lifting. This book provides a catalog of "design patterns" for building websites. If you are looking for an ecommerce site, here are the components you need to make it successful to your audience. It's basically a catalog of website standards that I use as a basic checklist for building sites from scratch and I also use it as a reference for evaluating the design of existing websites. I know I've discussed enterprise patterns with the Patterns of Enterprise Application Architecture book above, but this is geared more towards a .NET readership which is why I consider this the best .NET book for Microsoft developers. If you've been coding with .NET in a corporate environment for a while, this may be the only .NET book in the list that I suggest you pass on and purchase any one of the other books. While this isn't a programming book, it's always good to have a solid understanding of how to structure a web page using general design techniques. Also, the book is doing extremely well because they are on the 3rd edition and added a web chapter. Just as the Design Patterns book from the gang of four was a masterpiece, this book focuses on design patterns from the viewpoint of C# developers making it one of the best .NET books I would highly recommend. It covers the original 23 patterns including Singleton, Strategy, Flyweight, Factory, and others. The funny thing about these pocket references is that I've had web professionals come over and borrow them for a couple of days when the Internet was at their fingertips. Everyone knows "Uncle Bob." His coding experience is also apparent in this book. He covers Saying Yes, Saying No, TDD, Professionalism, Tooling, Craftsmanship, Mentoring, and Pressure just to mention a couple of chapters. It's more of a combination of programming philosophies, how to handle your programming career, and how to write code properly. While these programming books are by no means the end all when it comes to programming, they surely encompass a lot of experience, ideas, and designs that make this list of books an absolute must for up-and-coming developers. Did I miss any books on my list? Please post your comments below.